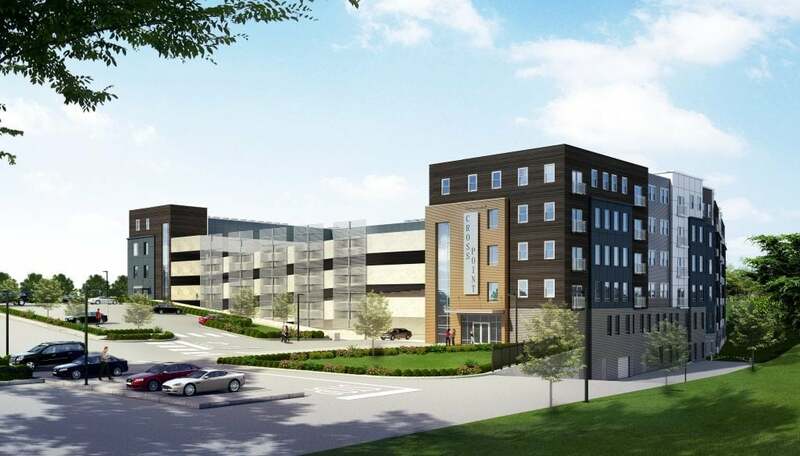 LOWELL, MASSACHUSETTS – Adjacent to the busy Lowell Connector and next to the redeveloped Cross Point Tower you will find the new Residences at Cross Point currently under construction. This 6-story building will include 240 market-rate apartment units wrapped around a 320 car precast parking structure. A central building courtyard will create a serene outdoor environment for residents including outdoor grills, fire pits, bocce court and gazebo with water feature. Interior amenities include: management and leasing office, fitness and yoga room, dog wash area, community room, billiards room, business office, dry cleaning exchange and cyber café. The building is scheduled to be completed in the summer of 2020.